The circumstances leading up to a motorcycle accident are unpredictable, but one thing is usually certain when these events occur: serious injuries are likely, and the victims are left with mounting medical bills. Riding a motorcycle is one of the more enjoyable leisure activities. The freedom of the open road and the feeling of the air makes the ride exhilarating, but at the same time puts motorcyclists at risk. Unprotected riders, particularly those without a helmet and other key safety gear, are at an even greater risk. Any number of injuries can occur when a motorcycle is involved in a crash. Motorcyclists often take the brunt of these crashes, suffering everything from broken bones to spinal cord injuries to traumatic brain injuries. Accident victims are often lucky if they suffer only broken bones and scrapes. The more severe accidents leave victims paralyzed and possibly dead. No one can predict if an accident will occur. For this reason, most people are left scratching their heads wondering how they’ll pay their medical bills. Hiring an experienced motorcycle accident lawyer is the best way to recover compensation and pay for your bills, though some people believe this option is too expensive. That’s simply not true. Seattle personal injury attorney Chris Davis – founder of the Seattle-based Davis Law Group, P.S. – make you pay absolutely nothing up front. That’s right, no money is due when you sign with an attorney. Instead, motorcycle accident victims pay a percentage of their settlement if – and only if – the case is won. This is called a contingency fee agreement, and allows victims of all backgrounds pursue personal injury claims. Contingency fees are effective for several reasons. First, it puts the burden on the attorney to win the case and get the largest possible settlement, which is good for all sides. Second, it enables victims of all financial backgrounds to open claims. Motorcycle accident victims should never let concerns over their financial status determine whether they can get the justice they deserve. If you or a loved one has been injured in a motorcycle accident and concerns over the potential costs of hiring an attorney have kept you from seeking legal advice, Davis Law Group can help. We can get you the compensation you deserve — money for medical bills, missed paychecks from time off work, and pain and suffering. Call us today at (206) 727-4000, use the chat feature below or fill out the form on this page for a free case evaluation. ?Is Lane Splitting on a Motorcycle Legal in Washington State? 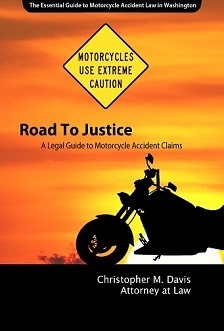 ?How Do I Find The Right Motorcycle Accident Attorney? ?How Much Does It Cost To Hire A Motorcycle Accident Lawyer?